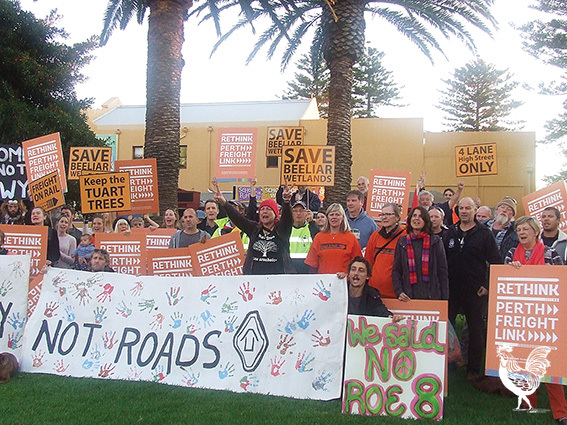 Protestors against the Perth Freight Link rallied in Fremantle on Wednesday afternoon. THE powerful Maritime Union of Australia is convening meetings in workplaces around the state to discuss campaigning against the Perth Freight Link. WA secretary Chris Cain told about 60 protestors from the new Rethink the Link alliance on Wednesday his members are committed to scuttling the Barnett government’s high-profile project. He later told the Herald the union will organise 500 protestors any time they are needed. Local protestors later marched through Fremantle and into Kings Square, where they were addressed by Fremantle mayor Brad Pettitt and Road2Rail campaigners Sam Wainwright and Barry Healy. Mr Healy told the Herald the MUA’s involvement was a huge coup for the fledgling alliance. “I feel very happy and secure to know the MUA has come out in defence of the environment, particularly when the premier is threatening this and that, because we’ll feel the full social and industrial weight of them on our side,” he said. COTTESLOE council is declaring neutrality on the Perth Freight Link despite a university report saying it will cause traffic congestion in the western suburbs. On Monday the seaside council rejected councillor Jack Walsh’s request that it write to local MP Colin Barnett—the state’s premier and chief freight link spruiker—to formally object to the $1.6 billion project. “They said it might not happen and that we’ll deal with it once it happens,” Cr Walsh told the Herald. Disappointed, he says his colleagues have made a mistake and fears it’ll be too late to fix problems once the council cottons on to how bad the link will be for the town. A Curtin University report this month stated more trucks will head down Port Beach Road and Curtin Avenue because of the government’s preference for road freight over rail.